I use pullsaws for a range of tasks such as dovetails, flush-cutting and for all kinds of difficult to access cuts in restoration work, and find them very useful. They do, however, require a somewhat different approach from the user. I am not talking just about the fact that you pull them instead of pushing them, but am referring to the fact that being rather delicate and prone to occasional bending, pullsaws demand more respect, something that is a normal part of craftsmanship in Japan but is not so well understood in the West. It used to be the case that every craftsman sharpened his own saws. If you have spent time filing each tooth evenly on each of your five or six main saws then you are bound to make sure that the saws are properly cased and protected. 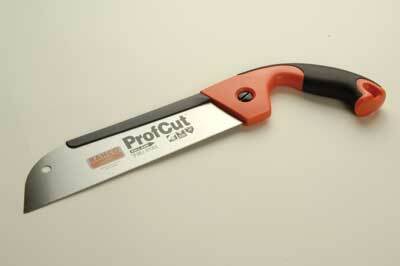 Training courses, however, stopped teaching saw sharpening and at the same time, hard-point technology was developed. This meant that while saws kept their sharpness longer they couldn't be re-sharpened. 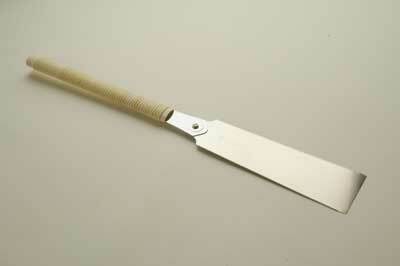 As owners no longer had to invest their time in sharpening their saws, they began to be regarded as a 'throw-away' tool. In fact that is just what early hard-point saws were, and the throw-away culture meant that saws were treated far too roughly. 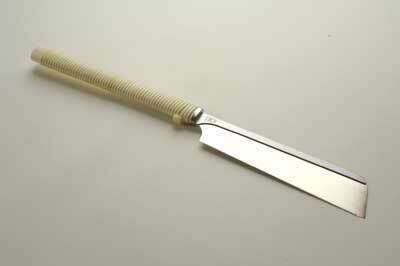 Being thinner than Western saws, Japanese saws would easily become damaged if treated badly. 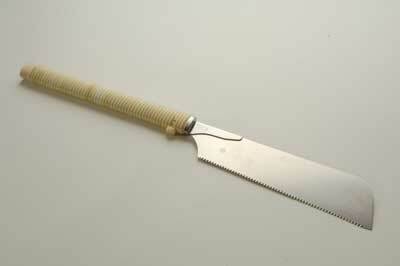 For that reason, Japanese saws were regarded as too delicate and special for the average toolbox. When I went out on site, tradesmen were amazed at my saws and the fine detail that they could cut. The blades of these Bahcos are actually made in Japan. The steel is slightly thicker than the Gyokucho equivalent and therefore are just that little bit more durable, but still made in the same Japanese way. Nowadays there is no reason for a tradesman not possessing at least one good pullsaw. For those of you who have never used a pullsaw before, success lies in having the saw straight in line with your arm and letting the weight of the saw do the work. Don't try and force it. The Bahco range of pullsaws is an ideal introduction to the tool. Without writing an essay on Japanese nomenclature, the division of saws by size, starting with the smallest, is dozuki, kataba and ryoba. The dozuki is a backsaw with a 0.5mm blade and 18tpi. The blade can be thin because it is in tension when used, unlike Western saws which are in compression. This dozuki's pistol-grip handle is comfortable and firm but feels unusual, if like me, you are used to the normal Japanese saw's straight handle. However the saw cuts perfectly well and at around Â£26 offers a good alternative to a Western tenon or dovetail saw. 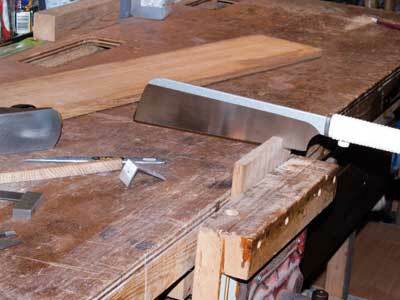 If you cut a lot of fine dovetails then I would recommend a true Japanese saw, see below. 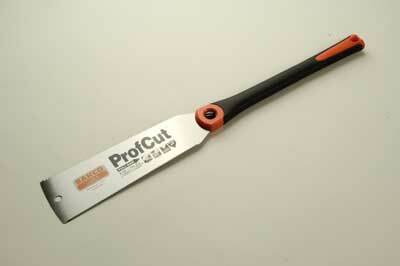 The Bahco ProCut kataba is 305mm long with 13tpi. This saw doesn't have a back and can be used as we would use a panel saw. Bahco's ryoba has a Japanese style straight grip. 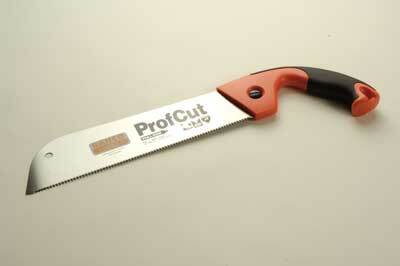 This saw is double-sided with rip and crosscut teeth, and is a razor sharp, thin, 0.7mm kerf-workshop saw. If you have not used pullsaws before or are a student on a budget, then it might be worth trying these saws. Replacement blades are available. Those who are converted to Japanese saws already will appreciate the Gyokucho brand. Their dozuki is only 0.3mm thick and has 20tpi. This is the saw that I have been using for the last 10 years. They also make a kataba and a ryoba and once again, replacement blades are available. With the dozuki you can trim 1mm off a piece of timber. Try a pullsaw and keep your kerfs thin!